We estimate whether migration can be an equilibrating force in the labour market by comparing pre- and post-crisis migration movements at the regional level in both Europe and the United States, and their association with asymmetric labour market shocks. Based on fixed-effects regressions using regional panel data, we find that Europe’s migratory response to unemployment shocks was almost identical to that recorded in the United States after the crisis. 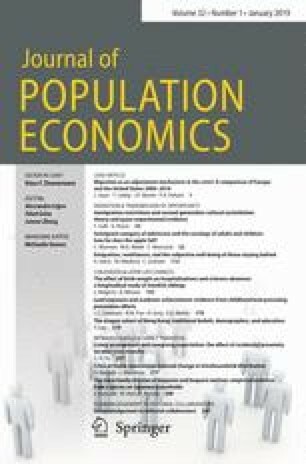 Our estimates suggest that, if all measured population changes in Europe were due to migration for employment purposes—i.e. an upper-bound estimate—up to about a quarter of the asymmetric labour market shock would be absorbed by migration within a year. However, in Europe and especially in the Eurozone, the reaction to a very large extent stems from migration of recent EU accession country citizens as well as of third-country nationals. We are very grateful to the referees and the editor for their helpful comments on an earlier draft which have greatly improved it. We also thank Franziska Braschke for helpful research assistance. The views expressed are our own and cannot be held to represent those of the institutions with which we are associated. This study was not funded by external sources.